With over 15 years of experience in the design and construction of commercial and residential pavements, Kerrigan Paving and Tar & Chip is one of the most experienced asphalt paving companies. We have established the industry standards of quality and detail at an affordable cost. Asphalt Sealing should be done approximately every 2 years to protect from damage done by the sun, water, gasoline and oil spills. These things can severely damage your Asphalt Installation, whereas, proper maintenance with quality products, can add years to the life of your Asphalt surface. Kerrigan Asphalt Paving and Seal Coating contracts are performed with our customer in mind. We instruct our employees to adhere to the strictest quality standards. All Kerrigan Asphalt Paving and Seal Coating employees hired and equipment purchased are done so with the goal of satisfying the customer with the highest quality paving services in the industry. Thorough estimates are made and approved prior to starting the work. We are class A state licensed and fully insured asphalt paving company and we assure you of the legal and financial protection you require. 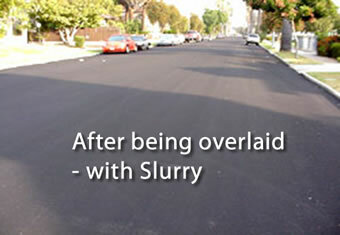 Slurry seal and surfacing provide many benefits: sealing the existing pavement from further water intrusion; restoring surface friction.